New car sales in Spain are up a robust 13.6% year-on-year in October to 95.108 units, the highest October score since 2009 (98.512), lifting the year-to-date tally up 7.3% past the million unit at 1.033.269, the fastest to reach this milestone in a decade, since 2007 (1.345.519). Company sales pull the market up this month at +19.5% to 33.131 units or 34.8% of the market vs. 33.1% a year ago. Private sales are up 10.7% to 55.460 or 58.3% vs. 59.8% a year ago and rental sales are up 10% to 6.517 or 6.9% share vs. 7.1% in October 2016. Year-to-date, it’s also company sales that do the heavy lifting at +14.8% to 300.191 deliveries or 29.1% share vs. 27.2% over the same period last year, rental sales are up 8.9% to 205.940 with a roughly similar share at 19.9% vs. 19.6^. The biggest losers are private sales edging up just 2.9% to 527.138 and seeing their share fall over two percentage points from 53.2% to 51%. The Clio (+45%) enables Renault to take the lead of the YTD brands ranking in Spain. In the brands ranking, Renault storms into the year-to-date lead thanks to an October volume up a stunning 46% year-on-year to 10.3% share, overtaking Seat itself up an equally impressive 36% to 9%. Volkswagen follows the market, up 14% to round up the podium ahead of Peugeot (+9%) and Opel (+3%) both underperforming, Toyota (+32%) and Citroen (+21%) also outpace the market in the Top 10. Below, notice Audi (+19%), Ssangyong (+20%), Jeep (+36%), Suzuki (+43%), Alfa Romeo (+47%), Ferrari (+80%), Aston Martin (+200%) and Tesla (+313%) all posting spectacular gains. 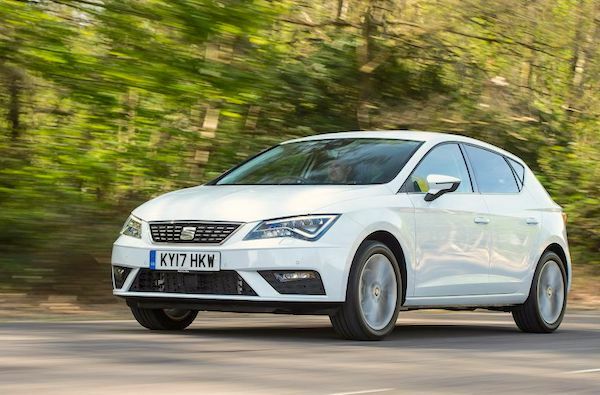 Model-wise, the entire Top 5 outpaces the market: the Seat Leon (+39%) is one percentage point of market share ahead of all other vehicles in the country, earning the YTD top spot off the Ibiza (+16% to #4) for only 17 units. 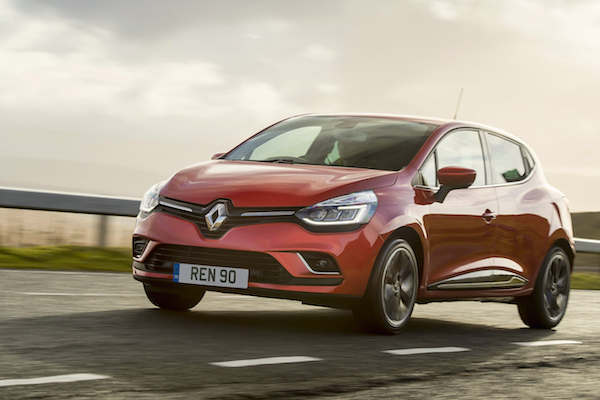 The Renault Clio surges 45% to #2 and the VW Golf is hip 58% to #3 while the Renault Megane is up 29% to #5. 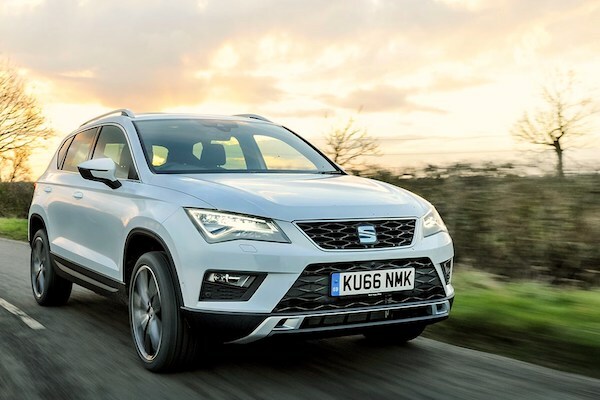 Just below, the Seat Ateca (+51%) beats its home ranking record again at #8, the Renault Captur is up 35% to #9, the Citroen C3 up 92% to #12 and the VW Tiguan up 39% to #13. The Peugeot 3008 II (+210%), Renault Scenic (+417%) and Fiat 500X (+121%) also post spectacular gains. The Toyota C-HR (#36), Peugeot 5008 II (#41), Opel Crossland X (#54), Citroen C3 Aircross (#64) and Kia Stonic (#78, first Top 100) dominate recent launches, the Seat Arona is up 79 ranks to #103, the Opel Grandland X up 43 to #108 and we welcome the Hyundai Kona at #110. 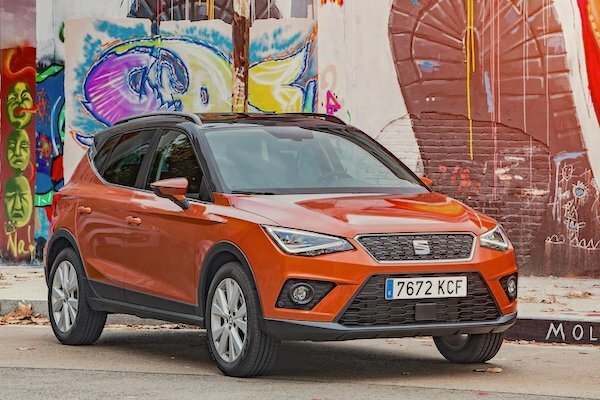 The Seat Arona is getting very close to its first Top 100 ranking at home. Full September 2017 Top 45 All-brands and Top 290 All-models below.